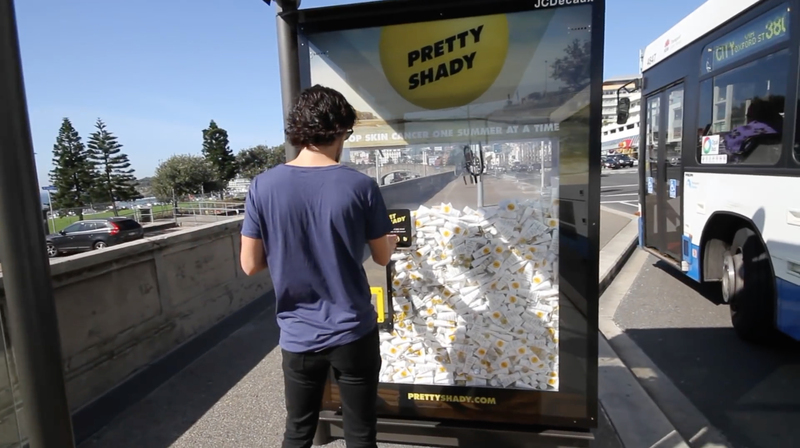 Cancer Institute NSW, JCDecaux, UM and Soap Creative have teamed up to create custom-built SPF50+ sun screen dispensers, in addition to bus shelter wraps that shade commuters from damaging UV rays. In a salute to the old-school ‘lucky grab’ crane arcade game, the custom-built JCDecaux Citylights dispenser panel – installed at Bondi Beach – is operated by a mechanical claw. The unique dispenser mechanism is designed to grab the attention of passers-by, playfully engaging them with a serious sun safety message. Bus-shelter wraps, including custom roof panels, have been installed throughout the CBD and summer hot spots to provide Sydney commuters with shelter from harmful UV rays and help to raise awareness of the ‘Pretty Shady’ sun smart message and overall campaign aim of helping to stop skin cancer, one summer at a time. The Pretty Shady campaign centres on its Sun Safe Collection of free, limited edition gear including a hat, sunglasses, umbrella, t-shirt and sunscreen, all available at www.prettyshady.com for the price of a social mention. The aim is to empower young people to get involved in the movement and encourage them to share their favourite Pretty Shady looks online. The campaign includes social media and a set of videos using a large yellow ball to symbolise the threat of skin cancer in Australia.